"Your Premier Melbourne Public Adjuster"
Insurance Assurance Inc. your premier Melbourne Florida Public Adjuster. Your Public Adjuster successfully representing many policyholders throughout Melbourne Florida and all of Brevard County Florida. We are Brevard County residents with our office located in Brevard County Florida since 1999. Public Adjusters are your insurance claim adjuster working only for you the insured. The insurance claim adjuster sent by the Insurance Company is their insurance adjuster and has a fiduciary duty to their client the Insurance Company, not you. As your insurance claim adjuster; we inspect the loss site, analyze the damages, assemble claim support data, review the insurance coverage’s, determine current replacement costs, etc. We know how to properly investigate, document and get claims resolved with the maximum recovery. Why should I use a Public Adjuster? 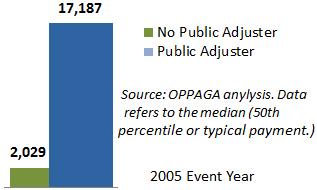 In a report by the office of program analysis and government account ability for the state of Florida dated January 2010 Policyholders with public adjuster representation typically received higher settlements than those without public adjusters This report denotes 2005 hurricane claims with public adjusters resulted in a 747% higher claims payment. Click here. As a result of Pipe Break/ Broken Pipes claims, many consumers have advised us the Insurance Company adjuster asserted they needed to re-pipe the broken pipe overhead and afforded no option of repair to the original piping. Numerous consumers with repair by overhead piping are now reporting serious issues and concerns. There are pros and cons to this type of fix. Talk to a professional Public Adjuster prior to agreeing to this type of repair. Most policies provide for restoration and it is your choice as to the type of repair. Although once you agree to this type of repair, you may well be stuck with it. As a result of Water Damage restoration/ Wind storm/ Tornado & Hurricane damage claims; consumers have advised their electric bills are a little higher to hundreds of dollars higher since their loss, cabinets and furnishings falling apart and/or they now have mold and mildew issues. As a result of Fire Damage restoration claims; complaints of smoke smell and odors that have never dissipated from a loss years prior and/or mismatched, improper repairs and resulting mold from the firefighting efforts. Many consumers contact us with complaints of Insurance Companies and/or their insurance adjusters advising using their “Preferred Contractors” or recommended contractors. Even offering to warrant repairs and give discounts on the deductible. Unfortunately we receive continued complaints as the repairs fail to properly indemnify the insured’s with incomplete repairs and when complaint is made they find that their complaints are either not part of the agreed scope of repair between the Insurance Companies adjuster and their contractor or excluded from the warranty. We advise not to contract with anyone until you are provided a complete estimate to which you agree. In our free consultation we will gladly go over these type estimates and advise if they are fair and complete restoration of your damages. Recently we have received numerous complaints of at least one carrier asserting their option to repair and making demand for return of a completed work authorization. Based on advisement from counsel the Insurance Company’s option to repair should not contain any type of work authorization. We have assisted many consumers in this situation. Call for a free consultation 321-735-6428. Never hire a Public Adjuster or Contractor who is canvassing neighborhoods or knocking on doors? Many Public Adjusters and contractors monitor fires and canvass neighborhoods that have been devastated by recent storms. No one from Insurance Assurance Inc. has ever harassed consumers after a loss. Beware of these Public Adjusters and contractors that knock on doors say they are representing your neighbor’s or just in the neighborhood. Most will provide inferior services and are nowhere to be found for repairs or problems. Insurance Assurance Inc. your premier Melbourne Public Adjuster since 1999. Are all Public Adjusters created equal? All Public Adjusters are not created equal. As a result of our principles own losses and dissatisfactions he encountered in retaining Public Adjusting services, he became a Public Adjuster Melbourne and our company is founded to provide the best possible service for each individual client. Why should you consider Insurance Assurance Inc. your Premier Melbourne Public Adjuster? Our Integrity, Honesty, Professionalism and Experience = Prompt Resolution and Maximum Recovery of your claim. Insurance Assurance Inc., your premier Orlando Public Adjuster. What qualifications are you looking for in a Public Adjuster? We deal with insurance adjusters all the time that have worked with the insurance companies for years and who are unaware of coverage's and benefits failing to properly indemnify insured's. Just because they learned it wrong doesn't mean they are right. Does that public adjuster know? We do. Get what you are owed not what the insurance company wants to pay. Insurance Assurance's Conviction is to receive fair and full benefit in accordance with the insurance policy and this is the conviction that is provided to our clients. We work for you not, the insurer. Conscientious Public Adjusters can make a tremendous difference in the amount and quality of a policyholder's settlement. We know the insurance business and are familiar with all procedures and also work hard to get Maximum recovery for our clients. Client’s satisfaction is one of our primary goals. We work hard and do our best to provide clients the best satisfaction. Insurance Assurance Inc., your premier Public Adjuster Melbourne Florida is a Better Business Bureau accredited Business with an A+ rating. Call us today to have one of our Public adjusters give you FREE professional advice on your claim. Disclaimer : Insurance Assurance Inc. has prepared this website for informational purposes only; it shall not constitute legal advice and should not be construed as such. The information on the website is provided only as general information that may or may not reflect the most current developments. Your specific needs are unique, and will depend on facts and circumstances that may not be addressed in this website. © 2015 Insurance Assurance Inc.